City ID’s mission was to develop a multi-modal wayfinding program from strategy to system implementation, commencing with the city’s iconic Metro system, the jewel in the crown of its public transit system that is used by 9 million people every day. The aim was to improve the flow of people through the complex station environments, some of which have as many as 15 exits and multiple transfer options. The main challenge was conveying the complicated environments clearly, while revealing transfers and end destinations, as the length of walk involved in making a mistake is significant. 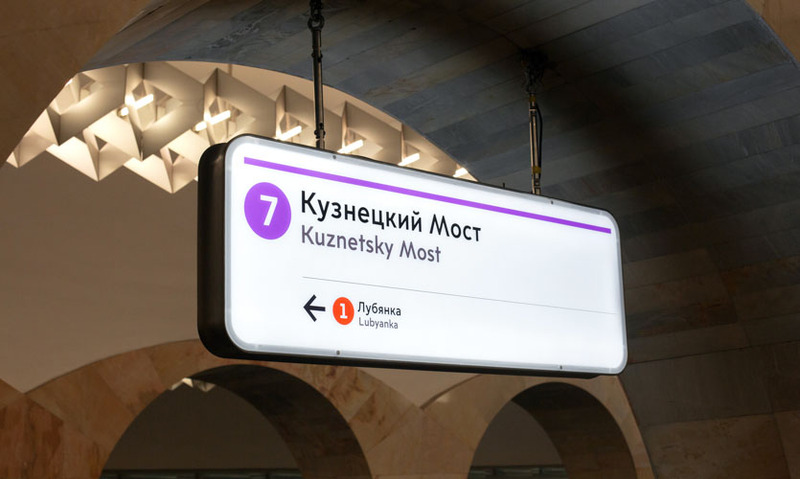 The scope was to develop a wayfinding and information system with a bespoke graphic identity to support greater connectivity and transfer between travel modes within Moscow. 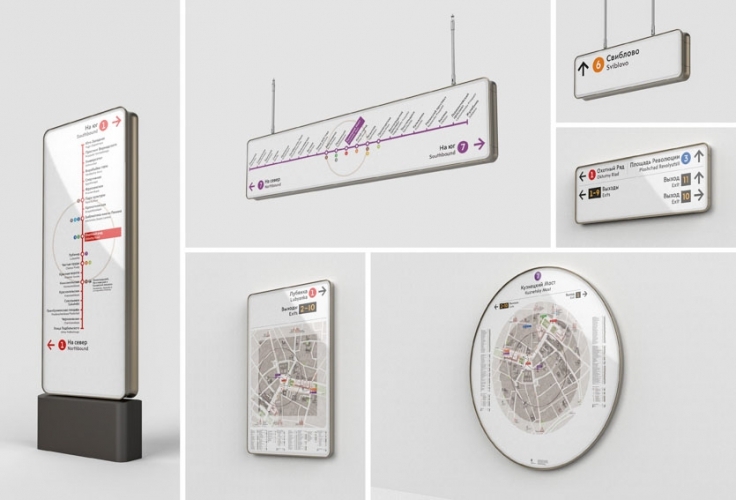 The project was initiated with a conceptual phase, in which a concept strategy for a wayfinding system was produced. Outputs included a report with accompanying video and product mock-ups to demonstrate the principles and approach in the development of the system. The following phase was underpinned by the production of a comprehensive wayfinding strategy for the design and implementation of the solutions identified in the conceptual phase. 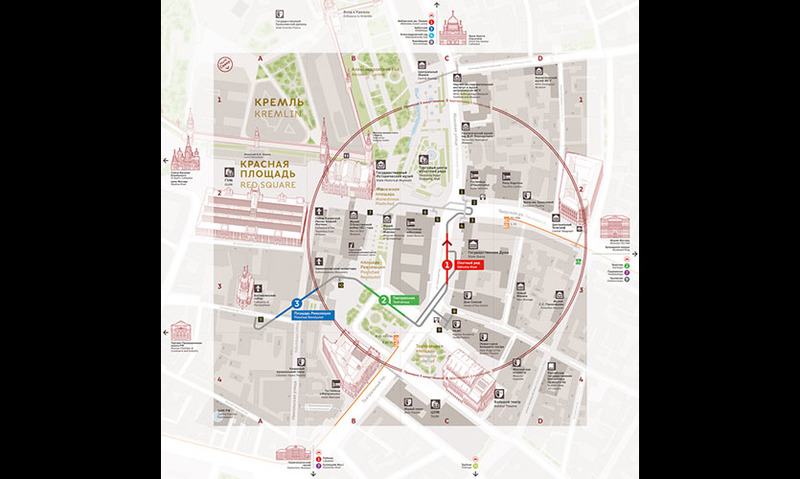 An analytical audit of the existing wayfinding provision in Moscow was followed by recommendations for a pilot area in which to conduct a pilot project. The pilot area consisted of two station clusters: Kuznetsky Most and Lubyanka; and Okhotny Ryad, Teatralnaya and Ploschad Revolutsii. Together, these two clusters formed a strong pilot area due to their close proximity, central location, differing typologies, varied user types and complex environments. Project stakeholders and members of the public were consulted at various times throughout the evolution of the system, from mental mapping exercises to testing full-size product mock-ups in situ. Insight and feedback consistently informed the process to influence design decisions. A bespoke range of products have been designed and manufactured to respect and complement the environments in which they are situated. Every product is created for its specific location, providing tailored travel choices to enable people to move with confidence and identify their transfer, or guide them to their final destination with ease. Exits have been allocated numbers to allow people to follow them on direction signs along platforms and corridors. Intuitive maps and diagrams were designed to help people make informed decisions and act upon them with efficiency. These included heads-up pedestrian maps at key decision points, showing the city above ground when viewing it below ground, with subterranean routes overlaid onto geographic maps, in order to help people decide which exit to navigate to. Required map resources were defined and created, together with a strategy in which to organize and manage them. City ID worked with Billings Jackson Design to develop a family of highly functional, modular products for use across all public transit modes for a range of internal and external environments, in a palette of materials suitable for the various environmental conditions in Moscow. The dignified and elegant physical form of the product design is a response to the architecture of Moscow Metro’s interiors. The circle, which is a consistent architectural feature, is integrated as a signature component of the design language within the system. A responsive visual identity, also inspired by and rooted in the DNA of Moscow, was developed as the voice of the system. 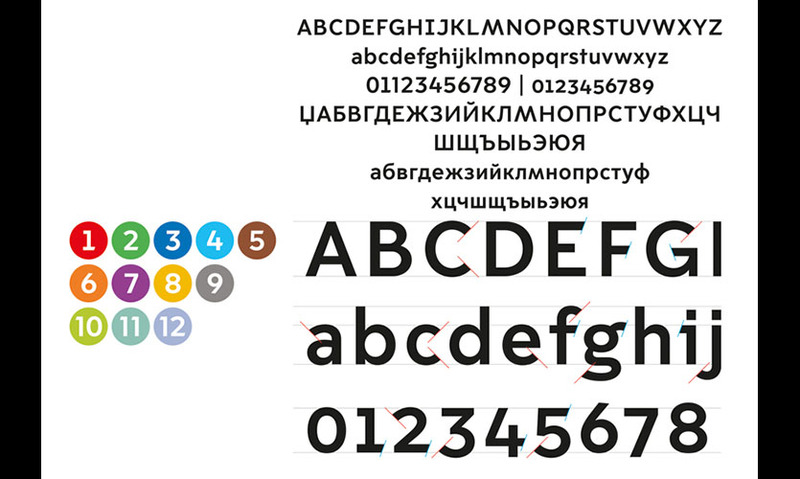 Grounded in the fundamental attributes of legibility and international recognition, the design team created an iconic, bespoke font of four weights, together with a comprehensive set of pictograms that echo the expression of the font, alongside ornate and distinctive 2D and 3D illustrations of Moscow’s top landmarks to aid orientation and encourage engagement with the information. 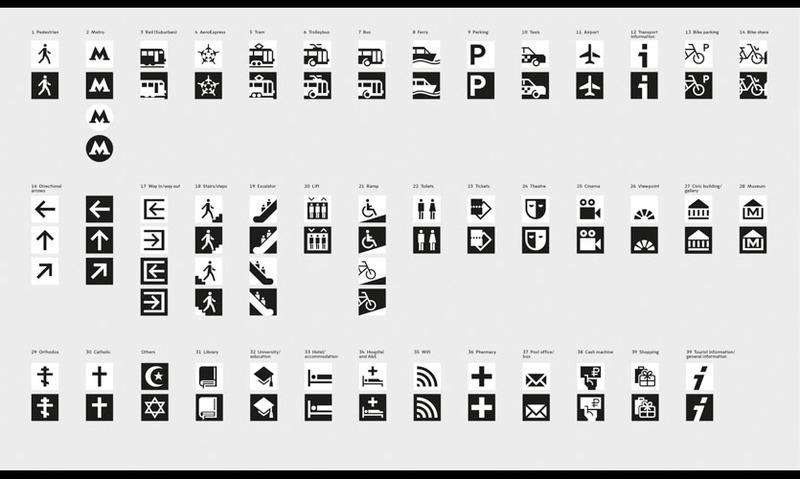 A product range of 17 sign types was developed for the system, providing information that is tailored to a wide range of key journey stages and locations throughout the transport network. A placement and positioning strategy with supporting training program was developed to capture the approach and principles in which to locate various sign types within Metro station environments, together with a roll-out and budget plan for implementation. 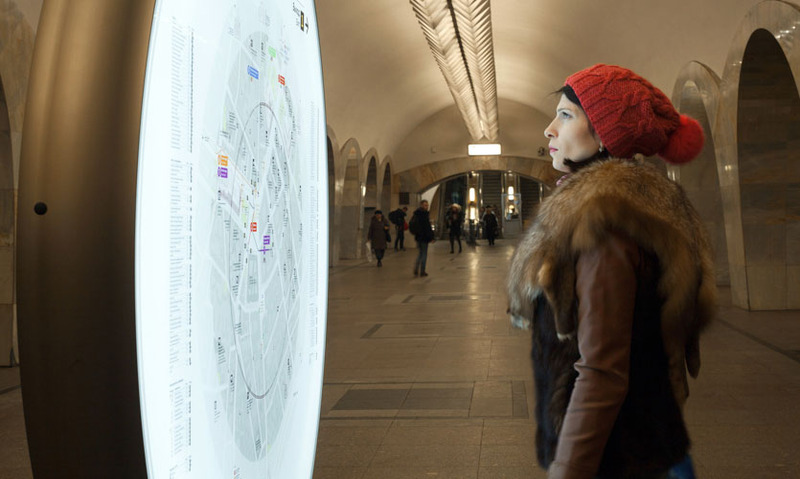 The system has currently been applied across five Metro station environments in the center of Moscow, prototyping the range of information and product types and testing the locations in which they are situated. User feedback captured on site and through social media reports the system has been very well received. 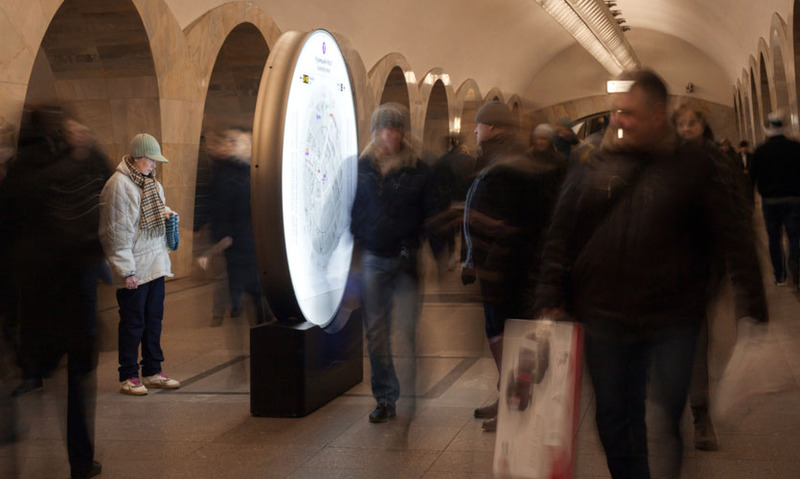 The system will be rolled out to all 190 of Moscow’s Metro stations, as well as other modes of transport including bike share, tram, trolley bus and bus – with bespoke shelters, real-time information totems and supporting street furniture. "In a highly complex system of routes and destination, this system is a highly ordered, visually pure example of transportation information. Incorporating a custom Gothic typeface and color-coding, this system appears to be inspired by the best attributes of the London underground and the New York subway system yet has its own sense of individuality. The rounded forms reference the architectural character of the underground stations and respect beautiful, ornate design in many of the Stalin-era stations. The system also promotes tourism and the visiting of historical places in a truly world city." "Moving 9 million people through Moscow each day is a monumental challenge. 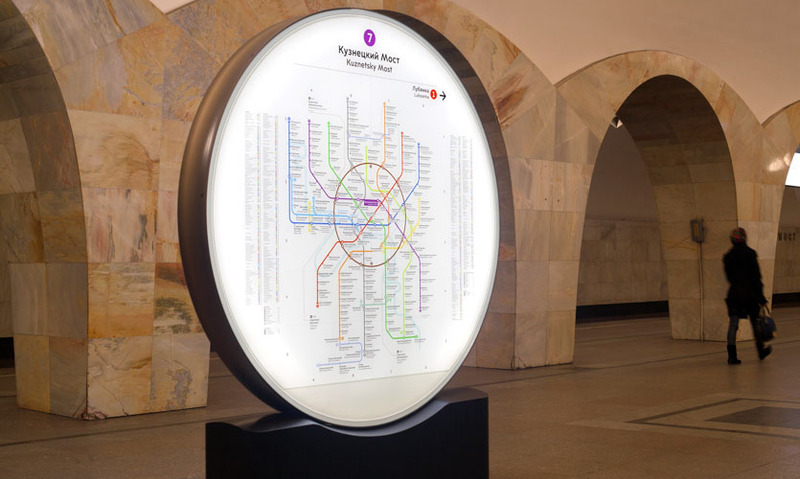 This ambitious project establishes a new visual identity and wayfinding system that balances consistent communications with unique station-specific forms."